SCRAPPING NOMAD: My blog has got attitude! My blog has got attitude! Let's Scrap 2-2-11 - Colour Invasion! Thanks Charlotta for giving me this prize! Having a look at your multilingual blog, I am thinking it would be a good idea to start posting in Spanish as well. Double the work, though, so I'll have to think about it a little bit longer. 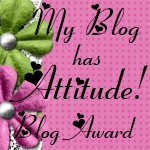 congrats on your blog award, definitely well-deserved, you always have great projects on here! !